The country's power generation capacity will go up to 20,000 MW in September next, said Finance Minister AMA Muhith. 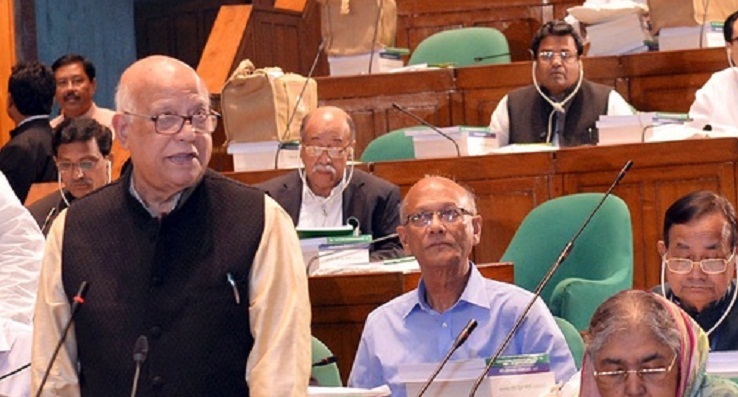 Placing the national budget for 2018-19 fiscal year at the Jatiya Sangsad on Thursday, Muhith described power and energy as the main priority sector of Awami League government. When the government took office in 2009, the power generation capacity was 4,942 MW, he said adding, "We prepared the 'Power Sector Master Plan' with a coordinated development strategy for power generation, transmission and distribution and implemented various activities following this plan." Power and energy sectors received Tk 24,921 crore in the proposed budget of fiscal 2018-19 against Tk 24,261 crore in 2017-18. Of this, the Power sector received Tk 22,936 crore while energy sector Tk 1985 crore in the fiscal 2018-19. Muhith said the government's target was to scale up power generation to 24,000 MW by 2021 and ensure electricity supply to all at an affordable price. He said the number of power plants rose to 118 from 27, while power generation capacity increased by three times to 18,353 MW, including captive power due to the government's persistent efforts. The Finance Minister pointed out that maximum power generation record reached 10,958 MW from 3,268 MW in 2009. During last nine years, construction of 2,622 circuit km transmission line, 174,000 km distribution line has been completed, he said adding that the length of present transmission and distribution line are 10,680 circuit km and 450,000 km respectively. System loss of power has come down to 11 percent from 16.9 percent during this period. The Finance Minister said overall the percentage of population under electricity coverage has increased to 90 percent from 47 percent. About ensuring energy security, he said the government put more emphasis on exploration of new oil and gas fields in the country. "We established 'Gas Development Fund' in 2009 to assist Bapex in exploring oil and gas exploration and conducting seismic survey and established 'Energy Security Fund' in 2015 for ensuring energy security," he said. He said with our sincere efforts, the storage capacity of oil has enhanced to 12.21 lakh metric tonnes from 8.9 lakh metric tonnes. "Oil and gas exploration activities were hampered due to financial constraint during previous regime. "We're currently extracting gas from 20 fields. Gas production capacity has increased to 2,750 million cft from 1,744 million cft in January 2009". Considering the demand of power and other industries for gas, Muhith said the government took steps to import Liquefied Natural Gas (LNG). Two Floating Storage and Regasification Units have already been stablished in Maheshkhali of Chattogram for importing 1,000 million cft LNG daily.